Through the course of our work, we partner with organizations throughout California and the U.S. whose missions touch issues and policy on a global scale. Every so often, we are fortunate enough to have an opportunity to tend to the garden in our own backyard by supporting local groups doing critically important work in our own communities. One such partnership is with the San Francisco Education Fund, the only organization empowered to train, clear, and place non-parent volunteers directly in San Francisco public school classrooms. After a merger and name change, the group had lost ground in recognition of its work, and the number of community volunteers participating in its programs had declined. The Education Fund began working with REACH to support volunteer recruitment efforts. The San Francisco Education Fund works to recruit volunteers for public schools. We conducted a series of interviews with volunteers and an audit of previous communications outcomes and existing communications tools; designed social media content to test the efficacy of various messages; and produced a multi-pronged volunteer engagement plan with key messages and distribution channels for distinct key audiences. With REACH spearheading media outreach, designing volunteer referrals, executing digital advertising and creating blog posts, the Education Fund saw a major uptick in volunteer recruitment. Sign-ups increased 82 percent over where they had been at the same point in the prior school year. Slots for top-priority programs in elementary school literacy and college and career counseling for students most in need of support had been filled even before the holiday push and New Year’s resolutions, traditionally a strong period for recruitment. As we wrapped up our formal support of the recruitment drive, REACH Communications Specialist Sarah Morgan and I attended the Education Fund’s holiday mixer, an event we had highlighted in the volunteer engagement plan and had supported with invite messaging and collateral. In talking to teachers, administrators, and other volunteers at the event, I found I had consumed our own communications Kool-Aid. So I signed up to fill one of the few remaining vacant middle school math tutoring slots. A few weeks later, I attended a busy volunteer training with dozens of other first-time volunteers and was placed in a classroom at a school walking distance from my home, at a regular day and time of my choosing. Every Wednesday at 4 p.m., toward the end of my REACH workday and after the school day, I spend an hour with Alex, a 7th-grader at James Lick Middle School. For the first two weeks, Alex was painfully quiet, answering most questions about his studies with a shake or nod of his head. Icebreaker math games to build rapport and a demonstration that I’m going to be there every week consistently have helped Alex slowly open up. 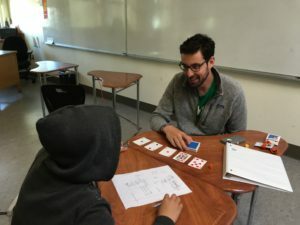 I’ve found fun ways to engage him, using dice or playing cards to illustrate concepts of probability, fractions, and decimals that are part of his curriculum. Alex has impressed me with math skills he previously kept hidden. As we continue to bond and work through challenges together, I’m optimistic his newfound confidence will help him excel in class. Education is one of the most pressing issues communities face. As schools deal with funding restrictions, the responsibility falls on everyone — parents, teachers, administrators, civic leaders, and community volunteers — to create better educational opportunities in their own backyard. It takes nuanced communication and engagement strategies to design campaigns that successfully build this sense of shared responsibility that drives people to action. REACH is committed to leveraging its expertise and skills to support these efforts. Seeing the hard work that is happening on the local level is encouraging as we partner with others dedicated to doing good.